Has been this price at my local Co-Op for ages. It's gone down hill in the last 5 years or so. My fav cider, great price. Cider used to be sold in 20 can packs! Then all the manufacturers reduced the pack sizes to 18 but the prices stayed the same. ;( The magic number to buy used to be 20 cans for £10 @ 50p per csn! Yup we did today on the tu range on top of the 25% , basically puts her wage back into the system . Yes my colleague, s wife gets 10 percent off. (lol) (lol) (lol) I find the cans not as fizzy as the bottles. Prefer the cans now. Had a few bottles out in the pubs last weekend and they tasted sweeter than normal. Of course that could be something to do with the 4 pints of Guinness before hand! Great price, the cans just never taste as good as the bottles. Still going to smash ‘em, it’s just going to cost me much more. Glad to help, saddened that living in Scotland, responsible drinkers have to order from England to get a reasonable deal,thanks for replying. Couple of pounds saving on what is usually over £8 unless buying in 20+ can packs. Have to agree with sam_of_london this stuff is rotten, not many cider's i dont like but this is one of then, im not sure what they changed because i did use to quite like it but it has a real weird taste now. Can't get a good booze deals in Scotland thank's to Nicola Jimmy Krankie Sturgeon no wonder we hate her. Never miss a 'Magners' deal again! I wondered why im kilt today! Any draught flow bitter for 50p a can? Because it feels very pretentious. They have a list of drinks which are apparently not "real" by their own definition and therefore everyone else is wrong. The link you posted claims that carbonation means it's no longer real. Well I like the bubbles! If I have to drink flat cider in order be thought of as a real cider drinking, then I'm not interested. I drink about 4 units per month of this type of drink in total so I would much rather have what I enjoy instead of striving to be "real." The "lager" bit was a joke by the way, as I knew you would bite ;-) lol! I think you'll find us CAMRA members drink flower water, not lager. I'm aware plenty of people drink the above Magners its well marketed but there's plenty of people who mistakenly think Magners, etc are proper ciders when they are not, you get what you pay for. They do use apples in the product however they are not cider apples so in order to make it taste right they use malic acid. The juice is sterilized which kills the natural yeast then packaged yeast has to be added. They also add in a lot of sweeteners as that is the market they have created. They also use apple concentrate which is imported from Belgium &amp; China. Proper cider often tastes like apple juice most people haven't tried it and are put off because of the mass produced products pumped out by the huge conglomerates. I also don't understand why you claim CAMRA is lager drinkers? they include a large spectrum of drinks/drinkers and regularly include real cider &amp; Perry at their festivals which due to popularity are the first to run out of the supplies on hand. Free pint or soft drink, no purchase required. Expires Thursday. I won't be using mine so if anyone wants It PM me your email address and I will email you the code. They seem to have vanished now? PM your email and i'll send you the 3 months tv player for nothing. Definitely in Livingston. We got a couple on Thursday night. £4 but they went quick. I believe the deal is in Scotland again. Whatever happened to the days of just putting Ribena in your cider? And some beer. And a bit of vodka at weekends. Just do like the Polish do and mix one of their flavoured syrups into your chosen drink (cider, later etc) . https://groceries.morrisons.com/webshop/product/Lowicz-Strawberry-Syrup/387634011 also occasionally available in Lidl for 99p. At less than 60p a can that's got to be good. Lidl Shoreham West Sussex. Sainsburys do 18 for a tenner as well But seeing as we don't have either here..... Heat added. 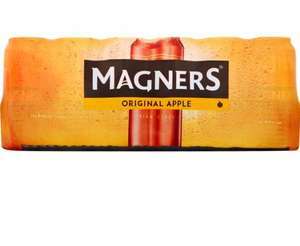 Magners 20 pack I believe is now expired - I think it's now £12. I think the Guinness may have gone up in price or possibly joined a 2 for £20 offer (so same price as before but now requiring you to buy two), in England and Wales only. Good deal if you can find it however Morrison’s. don’t deliver to many areas unfortunately. Guineas is still my favourite but it’s not as good as it used to be. They’ve reduced the %ABV to such a degree that it tastes weaker and watered down now. All to stop binge drinking. If you ask me they just like to tell you what you can &amp; cant do. Especially in the UK. Try the imported version and you will see a massive difference. Also cheaper in other countries too. Thanks for the deal OP. Appreciated. Mine had an ad up in the store that magners was £10, 50p a can, yet the price next to the case was £12. Usually I would buy at that price anyway, but trying to lose a bit of weight and cut the drinking.... so didnt test what it would scan as (im sure they would give it for £10 anyway given the massive poster that says its that price). 5L keg for £9.99 in store at B and M. Might be worth getting a few kegs ready for the summer/bbq season. Yes true. But in the pub you're paying for the table, lighting and service as well as the drink. Cheaper than the pub I guess. You can get 440ml cans (8s &amp;12s) of magners cheaper per litre. Break that down further, £1 per 500mil. What 500mil bottle cider can you buy at that price. So great price for the stronger version... Exp dates are great too... Set it aside in Garage and get it out in the summer with friends with BBQ. Cheap and refreshing over ice at £1 per 500mil equivalent bottle... Bet the Uni community will love this deal.. Lots of Heat OP... Great Find. In much the same way as they drink those coco pops flavoured ciders that are passed off as cider due to HM Revenue and Customs mad way of taxing. 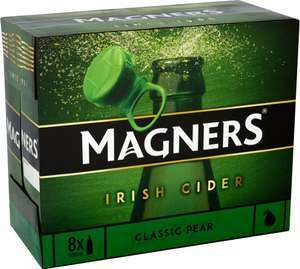 Great price Irish Apple Cider Magners Apple Cider; an intense apple tasting cider made from 17 varieties of apple that stands out from the crowd. Best served cilled over ice. I phoned Tesco a few months ago to see if they Price Matched, they said "Yes". Hope this helps someone.